When Benjamin Disraeli (1804-1881) determined that his rising ambitions required a personal motto, he chose forti nihil difficile, or "nothing is difficult to the strong." Strength of will, one assumes--for a Jew in pre-Victorian England had barriers before him that would have dissuaded most aspirants for status. Until 1829, Roman Catholics were disenfranchised, and could not hold public office or be involved in such professions as law. Universities were also closed to them. 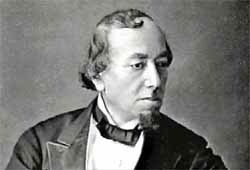 For Disraeli, born Benjamin D'Israeli in Bloomsbury, where his father was a dilettante man of letters, the path was smoothed by the nonbelieving Isaac, who, cynically, had his son converted, at twelve, to the Anglican persuasion, to open up opportunities. Always a romantic, Disraeli liked to believe that his ancestors were cultured Jews from Golden Age Spain, but in reality his grandfather had emigrated from Cento, in Italy near Ferrara, where he was a seller of straw hats. The family, before that, had probably come from Syria or Turkey. His recollections would sometimes claim Venice for his family. If their origins had to be in Italy, he preferred the most exotic of Italian places. He liked to think of himself as an aristocrat, even if not of the Anglo-Saxon variety. Technically, all England had to offer was open to Benjamin, but to Englishmen he was always a Jew-an identification he courted. Although it was a career liability, he refused to change either of his names but for excising the apostrophe. While he might have gone to a public school and then a university, he went instead to the law courts as an apprentice, then slipped into stock speculation, and bankruptcy. To make money he tried to concoct a popular fiction, publishing, anonymously, in 1826, the satirical society novel Vivian Grey. For its epigraph he lifted a line from The Merry Wives of Windsor, "Why, then the world's mine oyster / Which with my sword I'll open." The arrogance remained with him, but the book's initial success aborted abruptly when his identity as a youth utterly out of the social loop was exposed. Although he tried other novels, and would write fiction, often nakedly autobiographical, all his life, he fell into severe depression, coming out of it after he went, with a friend, on a Middle Eastern tour that included the Holy Land, about which he wrote in Alroy (1831). Paradoxically, the melodramatic novel, heatedly overwritten, about a pre-Zionist adventurer and martyr, David Alroy, glorified Disraeli's Jewish background just as he was adventuring in another career, politics, at a time when observant Jews were barred from Parliament. 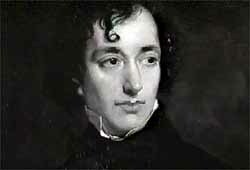 In his flamboyant style, which he advertised also in his Byronic dress and open (and successful) womanizing, he was announcing that there was no way the issue of his origins would not come up directly rather than through innuendo if the candidate for the House of Commons were named Benjamin Disraeli. Undaunted by losses in campaigns for several seats, Disraeli tried again in 1837, the year of Victoria's accession, and was elected as a Tory (Conservative). The party was traditionally protectionist regarding agricultural products, however that drove up the price of bread for the poor, as Tories represented the landed interests. Their powers then were being eroded by manufacturing and mercantile interests, both in the Whiggish (Liberal) hands of the burgeoning middle classes who stood to gain from freer trade and electoral reform that would enfranchise the industrial cities. Disraeli promoted a nostalgic and largely unrealistic Tory feudalism, a "Merrie England" that revolved about attachment to the land through the institutions of Monarchy, Aristocracy, and Church, and their noblesse oblige toward a peasantry he saw as including the new industrial work force. A compulsive novelist, he dramatized his sentimental Toryism, called by others "Young England," through a trilogy of novels, Coningsby, Sybil, and Tancred (1844-47) that also earned for him desperately needed money. To pay his increasing debts due to his election debts and his high lifestyle, he had already married the eccentric, off-the-wall, Mary Anne Wyndham Lewis, widow of his late campaigning partner, more than a dozen years his senior. She idolized him and he reciprocated her affection. Surprisingly, the marriage worked. But he seemed always in debt. The Tories would fragment on the issue of free trade, and Disraeli, a loyalist, inherited some of the remaining prominence within the party. On becoming a minority government in 1852, he would achieve cabinet office for the first time, as Chancellor of the Exchequer. The experience was brief, but it whetted his appetite for power and position, which left him in a quandary as the Commons debated, year after year, the issue of amending its oaths requirement to permit Jews to sit. Several, including Lionel de Rothschild, one of the world's most influential bankers, had run time and time again, rejected after each election by their refusal to take a parliamentary oath on the Christian bible. Rothschild had already turned down a baronetcy from Victoria, as only a barony would place him in the House of Lords, where he might defy the oaths requirement in the upper house. 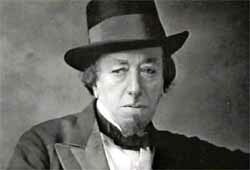 Despite his friendship with the Rothschild family, Disraeli was at first reticent about speaking out. He had to worry about re-election. Finally he did so, several years running, and the issue was finally decided in 1858. Indirectly the end of the impasse improved Disraeli's chances for higher office. As social and political bias decreased, his status went up. Both Victoria and Albert had distrusted him as an ambitious upstart. Toward the end of Albert's life he began to appreciate Disraeli's rare abilities, and after the prince's death in 1861 "Dizzy" because an intimate of the reclusive queen. Several years later, in the ministry of the Earl of Derby, Disraeli was again Chancellor of the Exchequer and his political heir apparent. With legislative finesse he accomplished an unpredictable turnabout by pushing through Parliament a liberal election reform bill that was even more liberal in extending the franchise than the opposition, suddenly forced to take a stand on it, might have approved. (His theory was that many of the new voters would vote Tory.) With Derby's retirement in 1868 because of ill health, Disraeli reached what he called "the top of the greasy pole." A general election the next year ended his ministry, but he returned in 1874 , after Mary Anne's death (in 1872), remaining prime minister into 1880, a lengthy term marked by administrative reforms, a new emphasis upon empire-building that led to the purchase of a controlling interest in the new Suez Canal in 1875 (with millions borrowed from the Rothschilds), and the addition to Victoria's title of Empress of India. But new troubles in the Balkans would bring his ministry down. After his elevation as Earl of Beaconsfield, to move him into the House of Lords, and his triumph in settling Eastern Mediterranean questions at the Congress of Berlin, new problems erupted in the Balkan territories long part of the Ottoman Empire, and the Liberal opposition led by W. E. Gladstone charged that Disraeli, to prop up a decadent Islamic imperialism, was ignoring atrocities against Christians. New allegations including a dimension of anti-Semitism never far below the surface in Victorian life surfaced against Disraeli. The muckraking weekly Truth declared, absurdly, that "a tacit conspiracy has . . . existed on the part of a considerable number of Anglo-Hebrews, to drag us into a war on behalf of the Turks" because of "affinity of race and feeling between the Jews and the Turks." It left no doubt that the prime minister, allegedly "the Asian Mystery," was a co-conspirator. Although Disraeli might have survived that, and the increasing demagogic campaign of Gladstone, his health was failing, and his campaign in the general election of 1879 evidenced exhaustion. An economic depression also cost him votes, and finally his ministry. He had published a novel, Lothair, in 1870, after his first defeat. In 1880 came his last completed novel, begun earlier, the nostalgic autobiographical fantasy Endymion, set early in the century. It was the tale of a handsome young man taken up by attractive and amorous-and politically ambitious--older women, and propelled into high office. And in the background, with religious identity left ambiguous, is a banking family clearly the Rothschilds-his final debt to his most steadfast of friends. In his last months, in a house on Curzon Street, in Mayfair, the ailing Earl of Beaconsfield began writing a new novel, Falconet, about an ambitious, utterly hypocritical, politician clearly meant to skewer his old adversary Gladstone. The suggestion that Victoria, who adored Disraeli and whom he called "the Faery [Queen]," might visit him in what he knew was his last illness (he was dying of renal failure), was rejected with a quip. "No, it is better not," he said. "She would only ask me to take a message to Albert." When he died on April 19, 1881, at 76, the queen sent a wreath "from his grateful and affectionate Sovereign and friend, Victoria R.I." In her change of royal style he had provided the "I." Below was a quotation she had chosen from Proverbs: "Kings love him that speaketh right."